Peter Shillingsburg, Professor of English, University of North Texas, embodies the recent important convergence of digital information technology and the theory and practice of textual scholarship and scholarly editing. 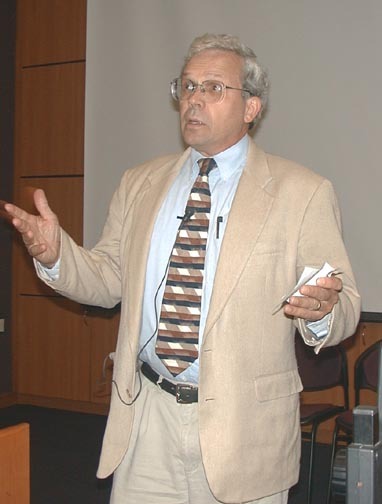 Professor Shillingsburg, who taught for many years at Mississippi State University, is the developer of CASE (Computer-Assisted Scholarly Edition). CASE (Computer Assisted Scholarly Editing) is a suite of 9 programs designed to assist textual research from examination of source texts through the generation and display of textual variations and textual histories. Programs produce fair copy from diplomatic transcriptions, list of alterations in manuscripts from diplomatic transcriptions, collate texts from different editions and manuscripts, generate historical collations, and enable sortings and alternate displays of textual variants. Output from each program serves as research information and verification stages and serves as input for subsequent steps in the process. CASE is used by major scholarly editing projects on Thomas Carlyle, D. H. Lawrence, Joseph Conrad, William Makepeace Thackeray, Australian Literature, and has been used on individual volumes of Dreiser, Irving, Yeats, and others. Peter Shillingsburg is also the author of the influential General Principles for Electronic Scholarly Editions (1997) issued by the Committee on Scholarly Editions of the Modern Language Assocation of America, and he serves as both Review Editor for Text and as a member of the executive board of The Society for Textual Scholarship. He is general editor of The Works of W. M. Thackeray (U Michigan Press) seven volumes completed.